If HG were a Spice Girl (yes, we realize how dated this reference is), she'd be Hungry Spice, of course. And the song lyric "So tell me what you want, what you really, really want..." would be all about which guilt-free latte to sip. 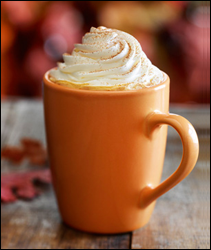 This time of year, like many of you out there, we really, really want PUMPKIN SPICE! 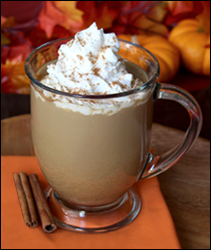 Place powdered creamer, sweetener, coffee granules, and pumpkin pie spice in a tall microwave-safe mug or glass. Add 3/4 cup very hot water and stir until creamer and coffee granules have dissolved. Add canned pumpkin and stir until blended. Add soymilk and mix well. Microwave for 30 - 45 seconds, until hot. Give it a stir, and top with Reddi-wip. Sprinkle with additional pumpkin pie spice, if you like, and enjoy! Our relationship with Starbucks is a complicated one. We know which drinks are safe to order off of the chain's menu. However, every now and then a flavored coffee drink comes along that can't be ordered "skinny," but it's something that we MUST have. Like the beloved seasonal sipper known as the Pumpkin Spice Latte. Even if you order it with nonfat milk, a Tall one with whipped cream still has 260 calories and 6 grams of fat, not to mention SO MUCH SUGAR... 38 grams, to be exact. That's why we like to make our own version (and you will too). Our unique take on this creamy concoction is SO much more than a "wannabe." Not only does it have REAL PUMPKIN and an impressive fiber count -- take THAT, SB! -- but it also has far fewer calories, less fat, and a fraction of the amount of sugar. Hungry Girl power! Share the goodness! Click "Send to a Friend" to pass along this email to the spiciest gals and guys you know. Don't yawn when you read this -- today, November 15th, is National Raisin Bran Cereal Day. (We said don't yawn!) Some versions of the cereal can be MUCH higher in calories than you'd expect. Play it safe, and chew some Fiber One Raisin Bran Clusters!